Nigerian Coach Gernot Rohr looks during the African Cup of Nations qualification match between Nigeria and Libya in Uyo, Akwa Ibom State in southern Nigeria, on October 13, 2018. 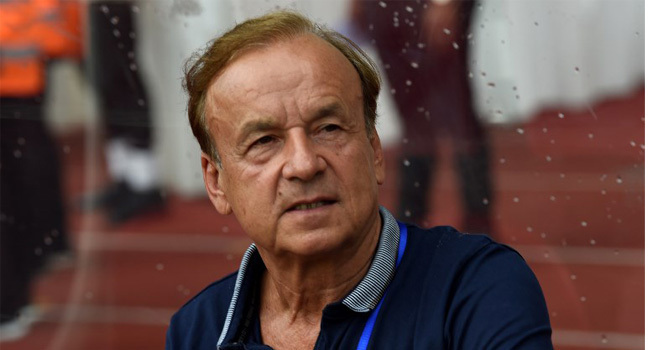 Super Eagles’ head coach, Gernot Rohr and team captain, Ahmed Musa have described Nigeria’s African Cup of Nations (AFCON) group B pairing as a ‘tough one’, insisting that the team must be at its best to get out of it. Nigeria was drawn in group B with Guinea, Madagascar and Burundi for the tournament holding in Egypt between 21 June – 19 July 2019. The two top –placed teams in each group, as well as the best third –placed teams from four out of the six groups, will qualify for the knock-out rounds. Nigeria will play its group games in Alexandria with fixtures against Burundi on June 22 (7pm), Guinea on June 26 (4.30pm) and Madagascar on June 30 (6pm). Coach Gernot Rohr on #AFCON2019Draw. “Group B will be tough. Guinea 🇬🇳, Madagascar 🇲🇬 and Burundi 🇧🇮 are decent sides so we have to prepare well. We plan to play build up games vs Ghana(in Nigeria), and maybe Senegal.”#SoarSuperEagles #Team9jaStrong.